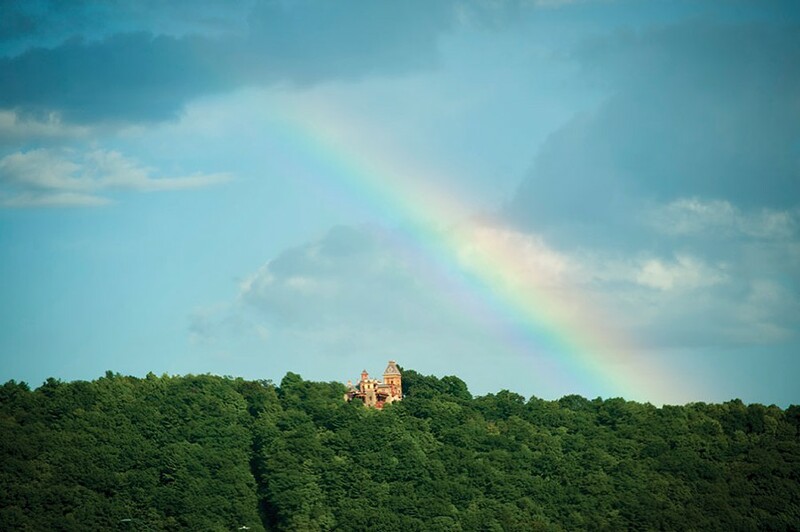 All of us here in the Hudson Valley knew it was coming. The next wave of gentrification. Indeed, many of us—this writer included—are transplants who came to the region years ago to escape the relentless grind, choking rents, and faded promises of that big Babylon to the south. But few of us could have predicted the breakneck change that has been sweeping Hudson, New York, of late. In the space of only a few years, the two-square-mile Columbia County seat has radically transformed, first from a decaying, crime-wracked landscape, then to an affordable urban haven for artists with a handful of antique stores and a couple of nice restaurants, and, finally, to a quasi-resort destination filled with five-star dining, high-end specialty shops, and tourists toting small dogs in shoulder bags. One wonders what the hookers and rounders who gave the town it unsavory reputation for centuries would've made of it all. 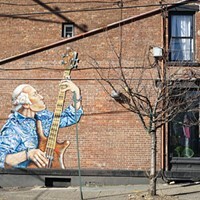 And just across the Rip Van Winkle Bridge from Hudson, in Greene County, is Catskill, another town with a blighted past that's following suit by remaking itself as a cultural hub. 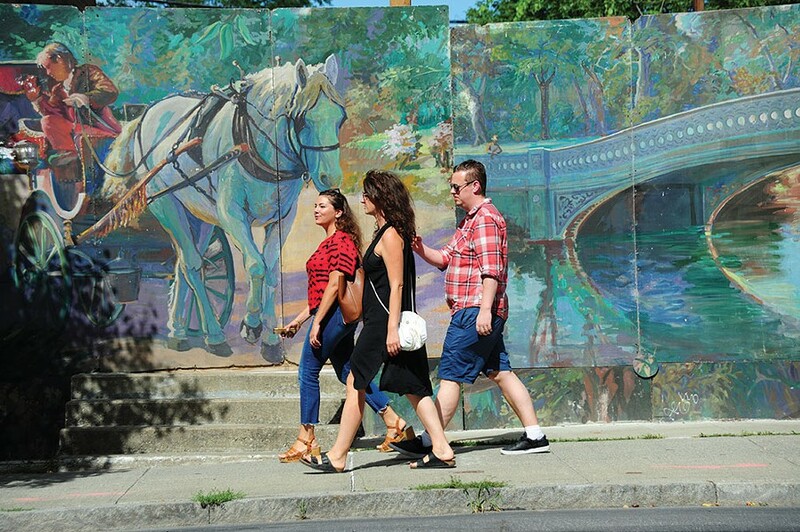 Walking past murals on Warren Street in Hudson. John T. Unger with a metal fire bowl of his construction. Long before it became the magnet for yachting types it is today, Hudson attracted sea farers of different stripes: specifically, whaling magnates and sailors. Chartered in 1785, the port city came within one of vote of being named the capital of New York. As the whaling trade died out, Hudson became a notorious center of gambling and prostitution, hosting the largest red light district in the Northeast until 1950, when state troopers closed down the numerous brothels that lined Diamond Street (since renamed Columbia Street in an effort to erase its seedy past). 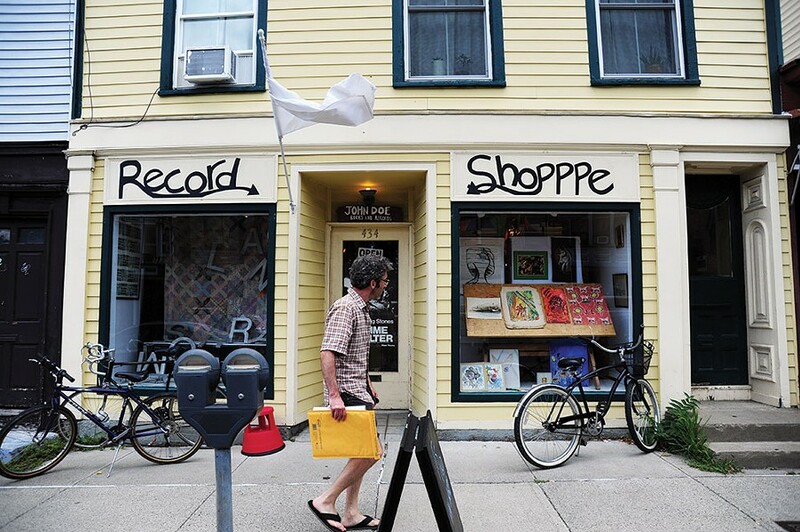 Severe decrepitude took hold in the 1960s and didn't ease up until the 1980s, when a handful of antique dealers opened shops on Warren Street, the city's main artery, and renovated several of the stately Victorian homes on Allen and Union streets. The city's new legacy as an antique hunter's El Dorado continues today with popular outlets like Riverfront Antiques and Design, Arenskjold Antiques Art, Hudson Supermarket, White Whale, Carousel Antiques Center, Furlong, Hudson Mercantile, Stair Galleries, Vincent Mulford, and Regan & Smith, and dozens more. Art galleries include Carrie Haddad Gallery, BCB Art, Limner Gallery, and others; the town is also home to a number of working artisans, like John. 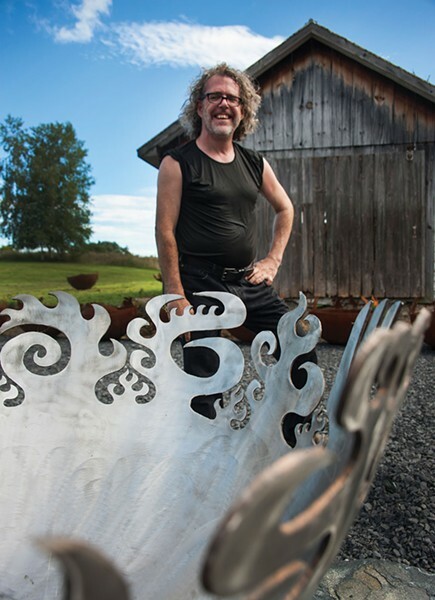 T. Unger, who creates dazzling sculptural metal fire bowls by hand. A.J. stirring a cocktail at Wm. Farmer and Sons in Hudson. 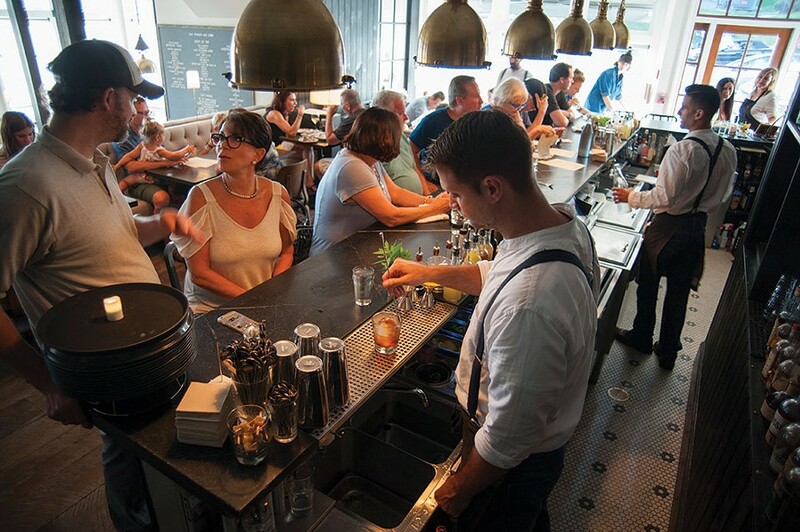 As a dining destination, Hudson is a regional standout. Its many exemplary eating establishments include Swoon Kitchenbar, Ca' Mea Ristorante, Grazin', Cafe Le Perche, Le Gamin, the Crimson Sparrow, and Fish & Game, the latter opened by top Gotham chef Zak Pelaccio of Fatty Crab fame; Pelaccio's latest local venture is Bakar at BackBar, which offers Malaysian fare in an open-air cocktail lounge. 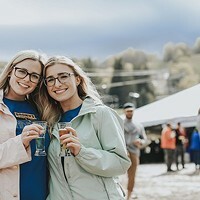 Casual eats are dispensed at Bruno's, Relish, Baba Louie's, Mexican Radio, Wasabi, Golden Grain Pizza, Tanzy's, and the newest addition to the Hudson foodscape, L'il Deb's Oasis, a converted neighborhood diner that now serves colorful "tropical comfort food." Seasonal street food vendors include Once Upon a Taco and Truck Pizza, and hot beverages can be had at MOTO, Nolita, Rev, and Verdigris. Among the growing roster of artisanal food merchants are bakers Bonfiglio & Bread, Olde Hudson gourmet food shop (now in a new location), Flowerkraut (flowers and handcrafted sauerkraut), Savor the Taste (olive oils and vinegars), Vasilow's Confectionary, and the planned Hudson Anchor Market and Supply, a fish, meat, and produce market set to open in the site of a former appliance store at Eighth and Warren streets. Mike Rice at BackBar in Hudson. Looking for lodging? Hudson has a considerable concentration of comfy traditional B&Bs. For standard accommodations, there's the renovated Rivertown Lodge and boutique hotels the Barlow, Wm. Farmer & Sons, and the Hudson Milliner, opened in 2013 by the couple of advertising photographer Shannon Greer and painter Charlotta Jansson. 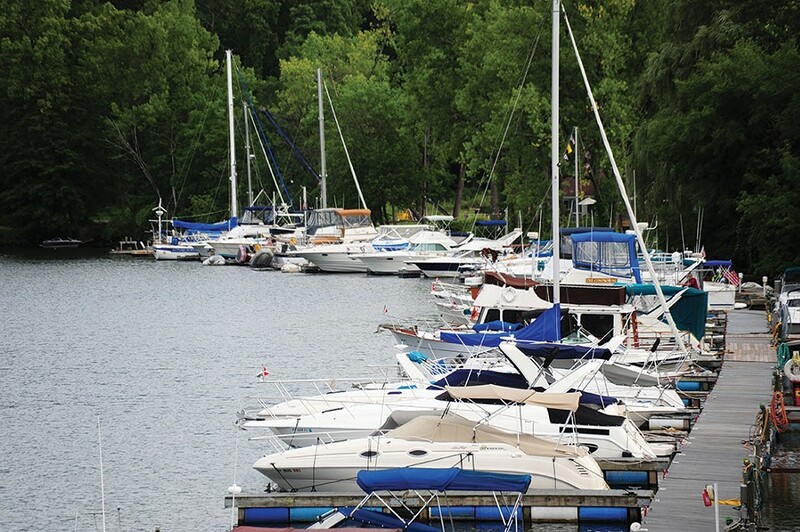 "Being right on the Amtrak line makes Hudson an easy place to visit," explains Greer. "What attracted us is that it's so beautiful and there's so much to do here," says Jansson, whose works are displayed throughout the antique-filled inn. Hudson is highly regarded for its entertainment spots. The 1855 Hudson Opera House, which was recently greenlighted for a massive restoration grant, and Time & Space Limited (TSL), which opened in 1991, both host a wide variety of performing arts programming. The city's live music venues include Helsinki Hudson, the Spotty Dog Books & Ale, and the Half Moon; no doubt it's Hudson's appreciation of music that has attracted such notable music-making residents as Tommy Stinson, Stephen Merritt, Meshell Ndegeocello, Ben Folds, Amanda Palmer, and Melissa Auf der Maur, who co-owns multi-arts center Basilica Hudson (instrument shops Musica and Niver's Inc. keep local players supplied). 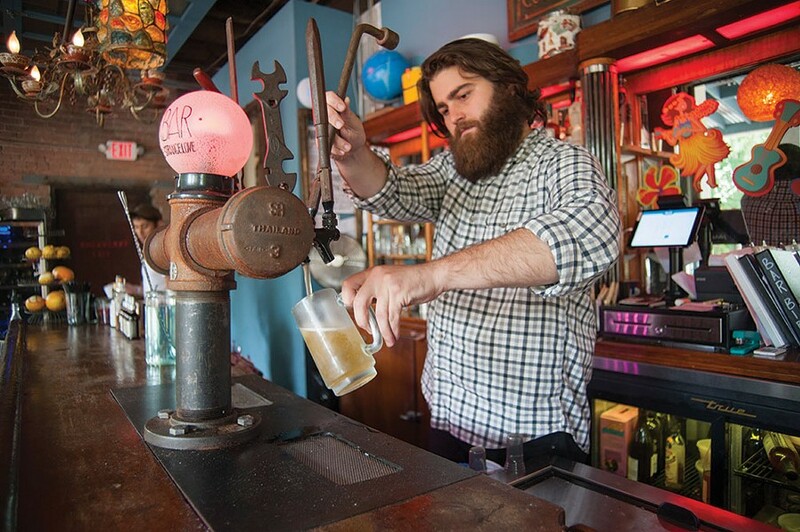 Hudson doesn't quite have the 50 bars it had during its red-light heyday, but there are certainly enough saloons in which to slake your thirst: Pub-crawl your way to mainstays Red Dot, Savoia, and Wonderbar and newcomer Ör, a former garage.